I don’t know if you’ve noticed, but more of us are left-handed these days. When I was growing up, I rarely met others like me. Now if I’m at a dinner party, several of us are jostling for table position. And while researchers look for an inherited gene, I’m here to tell you that the phenomenon isn’t genetic. No one else in my family as far back as my parents can remember is left-handed. My three kids aren’t either. When I chat with other left-handed people, they don't have other family members that are same-handed. There’s no question in my mind, though, that lefties have different brains. We are wired differently. We have more schizophrenia, alcoholism, dyslexia, and autism than right-handers. On the other “hand”, we produce more creativity – music, novels, architecture, scientific discoveries. Are we quieter, more introspective than our fellow right-handers? Do we spend more time observing than acting? I’m not sure. Maybe. I’d love it if you’d weigh in on this topic. Are you a leftie? Are you shyer, more reserved than your right-handed friends, more likely to sit in the back row? How about your family? Any other lefties? Another Left Handed Female here and I can relate to this Topic I'm the only Lefty apart from my Uncle, I definitely think we are wired different as I always can see an alternate way to do things than my Male Righty Partner and as for the Back row, in High School the Left Handed Desks were always in the Back :) and I am always grabbing the end of the Table in Restaurants. In the 1960's (and earlier) they used to force children to use their right hands in school. Parents were encouraged to ...well to encourage the use of the right hand. I went to Kindergarden in 1965 and they taught me to use my right hand even though I started off left handed. It's weird, because there are somethings that I'm better at left handed, but of course, now I can only write with my right hand. that may be why you see more lefties now - the schools and parents aren't forcing the kids to switch hands. (thank goodness!) I think it makes things awkward. To this day, everytime I start to write, my hand does this weird movement/twitch - like it has to find the right position. My maternal grandmother is left-handed (as am I) and my husband's paternal grandmother is, which means my daughter (who is also left-handed) has 2 left handed great-grandparents and me! She also has 2 great aunts/uncles and her grandfather who are left-handed (on my husband's side). We are a whole lot of lefties!! Yes, I am a lefty too, the only one in my family. You can always find me in the background of things, watching, and longing for my book. My mom is a leftie and she has the most beautiful handwriting! I was not in the generation of being forced to switch to my right hand, I was a kid in the 70's, so I was lucky. But, my biggest pet peeve is that companies still refuse to make kitchen products that accommodate left handed cooks. You would think someone would be smart enough to come up with the idea that left handed people cook too! Hubby and I are both 'lefties', Our kids all turned out to be right handed, but the majority of the grands are lefties too. I woo was 'encouraged' to be tifght handed in scholl, it just did not work! Me! And I blame my horrible handwriting on being a leftie, but I also believe that we are creative types. What a fun post, Deb! My mother was born left-handed, but in her generation schools forced kids to switch (oh, so that was her problem!). Her handwriting was always a bit odd--big and loopy. And no way was she reserved. But after skipping me, she passed the gene on to our daughter, who is definitely creative (at least with words). She and her grandmother share a total lack of interest and/or aptitude for any kind of hands-on craft. In fact, I still have in a trunk in the attic a baby sock that my mother started for me when I was born and never finished. But I do a number of things right-handed, probably because whoever taught me to do them was right-handed (I'm the only leftie in the family). My sister is the only leftie in family. I'm a rightie, but I can write left-handed if I have to; and it is legible. I'm a lefty, my father was a lefty (and with 9 sibs he was one of 4 that were lefty). His father had a brother who was force switched. Said brother eventually had a nervous breakdown. My Grandfather decided it was because he was forced to change hands and refused to allow his children to be switched. My father did the same thing for me, he went to my Catholic grade school and told the principal that I was left-handed, I would stay left-handed or he would pull me from the school. Since we paid tuition, I was "allowed" to be left handed forever. I agree with those who say that it was because people were switched and aren't being forced to change now that is swinging the numbers. I've got a friend who claims she is not nor ever has been left-handed, but when she is tired and eating she always eats with her left hand. Me, I believe she was switched. Another weird thing - when given a choice of paths, one left, one right, I take the left one every time. My family tried to change my ways and managed to confuse me into bowling and softball as a rightie. I'm really bad at those two. My aunt actually benefitted from being a lefty forced to write right-handed. She was a bookkeeper before computers so being ambidextrous meant she could simply switch hands when one got tired of printing numbers in the books. It looked the same no matter which hand she used. She's the only lefty in the family. I am a former leftie after an accident that damaged my tendon and my fine motor control forced me to learn to use my right hand to write. My oldest daughter is a lefty and her school used to have a Left-Handers Club :) When I was teaching, I had one class of students that was one-third left-handed! I know it has to be almost statistically impossible but true. It was one of the best behaved, most unique and smart classes I have ever had in 15 years of teaching. I read magazines from back to front, too. Just thought I was weird. Now I know it was meant to be. I'm also a leftie, but I am definitely not the quiet, reserved one. I am, however, the only one in my family that's left-handed. 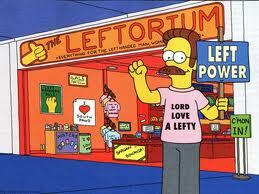 Lefties Unite!!! I was the only left hander in my family however both of our kids are left handed. I love to think of myself as creative, scatter brained, and any other fun adjective that pops up!! I do agree about needing more cooking utensils made for us...such as a measuring cup!!! Thanks for the interesting musings. We don't have any lefties in my family, and I haven't ever thought about what differences might exist between lefties and righties. I will have to start paying attention. My dad is a lefty, so he taught me to do quite a few things that way. I think I have an uncle on my mom's side too. I can write legibly with both hands. When I was bored in school I would write lefthanded just to amuse myself. I would write backwards as well. I guess I was very bored! I think one of my twins is going to be a lefty. I heard of a research study that it is quite common in twins to have one righty and one lefty. I'm a leftie!! My dad was too - he called us "cack-handed" - and we're definitely wired differently! It can be annoying though. I find it impossible to hold chopsticks. I am a leftie as well - the only one in my family. When I picked up the silverware in my left hand at a very early age, my mom would take whatever I had and place it in my right hand. I would always sit back. Also, I am a very shy and reserved person, even though I am 47. It takes me awhile to get to know people. Most of the time, I'd rather be reading as well. I'm a lefty too! There are a lot of us in my family, my dad was too, and so is my son. My nephew is a leftie and ever since he was little he drew pictures. Really good ones too. Very creative. He's pretty shy too, especially if he is a bigger group of people. Sadly, he won't be using his left arm/hand much in the near future has he broke his left arm in two places playing football recently. A really interesting blog - and the eps really sound interesting too - I douabt I'd be able to think of any as good as the ones you shared with us! I started out as a lefty, but I went to Catholic school. Need I say more??? Yep, I'm a leftie, the only one in my immediate family. My kids are right-handed, too. I learned to do many things with my right-hand and still can't use left-handed scissors. My husband is left-handed, and has a tendency to do things "backwards" - stapling papers on the right instead of on the left; placing papers in a folder facing the "wrong" way so that the folder has to be opened from the left instead of from the right in order to see the papers right side up; installing light switches with "on" at the bottom instead of at the top, and installing outlets upside down; etc., etc. And when I'm giving him driving directions, if I say to turn right his natural inclination will be to turn left, and he'll have to ask me again which way to turn. He has some dyslexic tendencies too; I wonder if those are the result of struggling to conform to a right-handed world. Fascinating topic, thanks for posting. My brother is left-handed, and holds his arm a weird way when he writes. But he is not shy at all, never has been. I got him a book last year for Christmas that was for "lefties"--it had all kinds of interesting tidbits about being left-handed, different left-handed famous people, and even opened up for the left side! I'm left-handed, and so is my father. He taught me how to cut meat and tie my shoes. He also taught me to turn the paper and not my wrist when writing! I work with toddlers, and recently one of my co-workers, a much older woman, slapped one of the kids on her wrist when she started to color with her left hand. I had to keep myself from slapping HER. I gave her a firm lecture about letting the girl choose her own handedness. Made me so angry! My maternal grandmother was left-handed but was hit with a ruler by teachers as a child to discourage it. Until she died, she could write with her right hand, but nothing else. Cutting, sewing, throwing, everything else was done with her left. So I get it honestly from both sides of the family!